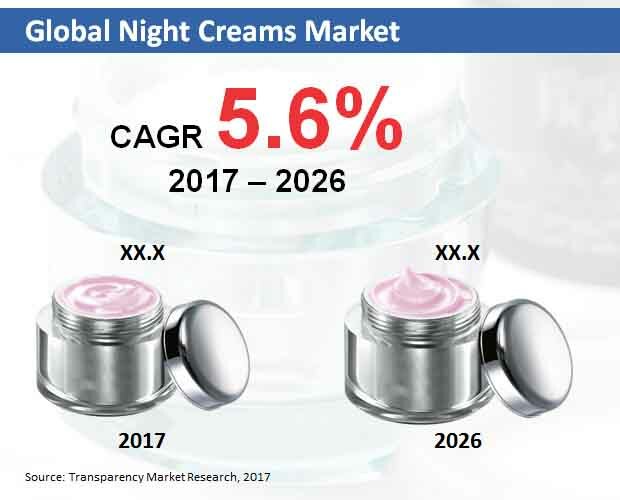 According to a recent report by Transparency Market Research (TMR) says that the global night creams market is anticipated to project a decent CAGR of 5.6% within the forecast period from 2017 to 2026. The market was valued at worth of more than US$6,500 mn in 2017. Product launch, development, and major acquisitions are among the ongoing strategies embraced by the market players. For example, a leading player in the amrket La Prairie recently took over Platinum Rare Cellular Night Elixir Rejuvenating Night Concentrate, which is a genuinely effective skin care cream. Owing to the launch of this product, the organization is focusing on buyers who are interested and capable of buying such expensive products. Moreover, Unilever has reported its takeover of Schmidt's Natural, a mineral based personal care organization. These organizations are concentrating on offering organic products available to every one of the buyers and offering transparency via this merger. Additionally, rising number of product launch in the market, along with mergers and acquisitions among the market players is likely to affect development of the global market in coming years. Unilever, Avon, Revlon, P&G, Beiersdorf, L'Oreal, Estee Lauder, Clinique, Shiseido, and Lancome are among the key organizations in the global market. The market is estimated to expand at a steady CAGR of 5.6% in forecast period. Rising requirement for skin repair solution has prompted a stimulated demand for effective moisturizing night cream. Moisturizing products are estimated to witness the most noteworthy growth in terms of revenue, representing an estimation of more than US$3,900 mn by the end of forecast period. Regionally, Asia Pacific market will keep on representing a dominant market all over the world. Before 2026-end, the region is likely to record the most elevated growth in revenue development, recording an estimation of over US$3,900 mn. What's more, the market in Asia Pacific is anticipated to witness the speediest development within the forecast period. Exposing the skin to extreme pollution, heat, and dust can result in accumulation of harmful substances that can prompt acne, irritation, and other skin issues, for example, skin break out, pimples, and dull spots. To keep up their skin health with the help of the day and night time, people are spending on a variety of personal care creams and face washes. Profiting by the growing skin needs of the buyers, major organizations are focusing on offering effective and helpful skin care products, for example, night creams. Key players in the personal care sector are concentrating on creating night time skin care cream that kill the harmful bacteria and contaminations from the skin. To better the buyer’s experience, organizations are putting forth powerful night cream particular to the prerequisites of skin conditions and issues for dry skin, extra dry skin, and oily skin. Be that as it may, makers are using ingredients, for example, liquor, paraben-based additives, and artificial dyes which can cause the ill-effects, for example, skin rashes and irritation. On the record of these components, sale of night cream is probably going to drop in the forthcoming years. Profiting by the growing skin needs of the buyers, major organizations are focusing on offering effective and helpful skin care products, for example, night creams. Key players in the personal care sector are concentrating on creating night time skin care cream that kill the harmful bacteria and contaminations from the skin.